"Hydrogyn is going to be big, very big..." – Michael Wagener, Producer (Ozzy Osbourne, Skid Row, Alice Cooper) IN THE BEGINNING… In January 2004, West Virginia guitarists Jeff Westlake and Jeff Boggs began work on a new experiment – a compelling modern heavy rock tour de force like no other on the scene – an outfit designed to destroy musical and industry barriers. Jeff Westlake on the blueprints behind HYDROGYN, “We wanted something a broad audience could love but also be something special. Something that stood out." 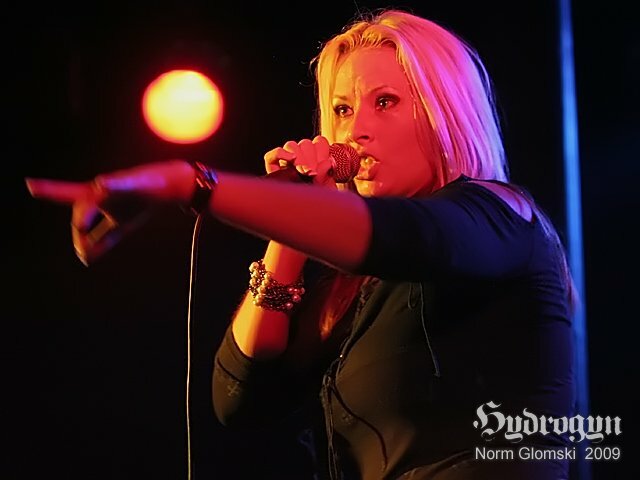 Fortified with cutting edge riffs, intelligent lyrics and massive hooks delivered by Julie (just “Julie”), a stunning front lady with a multi-octave range, the result is a formula set to conquer everything from Alternative Rock to Modern Hard Rock to Timeless Metal without sacrificing credibility. HYDROGYN is built to explode. RUMBLES… By the time the band’s self-produced debut hit the scene, the industry was already putting their ears to the ground, picking up on the rumble that is HYDROGYN. Best Served With Volume found the band in favor with soft drink giant Pepsi, who not only sponsored the fledgling outfit but hoisted them in front of tens of thousands strong at NASCAR (Chevy Rocking 400 May 2005). The audience response was nothing short of inspiring. It was clear, even without prior exposure to the band, onlookers fell into the hands of the fivesome’s massive, genre leaping sound and mesmerizing front lady, making the case that Jeff Boggs, Jeff Westlake, Julie, bassist Jason Fields and drummer Jerry Lawson were onto something. LIFT OFF “In 7 years of editing a major hard rock webzine, I have never seen an indie act with such a complete package – broad appeal, great musicianship, a dynamic front lady and most important, they are smart AND determined. They understand the big picture and are quickly becoming part of it. “ – Brian Coles, Editor - Electricbasement.com Hot off the heals of Volume’s release, HYDROGYN issued a professional video clip for the single “The Sand”, which was featured at the world renowned Electricbasement.com. The response to the bombastic music and sensual video was immediate, yielding the band radio guest spots across the country including www.Dailynoise.com and several Clear Channel stations including WAMX 106.3. Dark Vission TV jumped to put it in rotation, providing the band with massive exposure in Mexico and Latin America. Traffic to the band’s website soared, with visits eclipsing 25,000 per month, an astounding total for a new, unsigned band. Top-level affiliations began to pour in. Sponsorships with Pepsi, Mountain Dew, Dr. Pepper, Off The Rim, Eagle Distributing, Pearl Drums, Vic Firth Sticks and Loud City.net followed in rapid succession. More recent sponsorships include Randall Amps and Modules, Eden Bass, Washburn guitars, Groove Tubes, Royer Mics and Custom Gemstones. But it did not stop there. NOW Comics featured a HYDROGYN track, “Vesper’s Song”, as a CD single included with their acclaimed graphic novel release VESPERS® by veteran author/illustrator Tony Caputo. The novel and band are currently nominated for an IPPY Award, which is a top honor in the independent publishing industry. Caputo also assisted in making the band’s new, curvaceous logo, perfect for hot selling T-shirts and other merchandise. Taking advantage of this, the band signed a licensing deal with Crave Trendware, with custom HYDROGYN watches to see store shelves in early 2006. Julie’s visual and vocal appeal helped her gain notoriety with her very own column at Electricbasement.com called Julie’s Jolts, where visitors voted on which pics to include in her forthcoming calendar. The idea was a no-brainer after the brisk internet sales of Volume as well as a Julie poster that sold out a mere weeks after being posted in the band’s online store. The band’s ability to sell merchandise was another strong asset. SOARING HIGH In the Spring of 2005 the band received yet another jaw dropping accolade. Legendary producer Michael Wagener (Ozzy Osbourne, Skid Row, Alice Cooper) heard the band and was impressed to say the least, deeming them the best band he has heard in years. He also understood something else – the band could go over not just in North America, but also in Asia, Europe and South America. Once again, an indicator for the bands potential to cross borders, not just in genre, but geographical as well. So optimistic about their prospects, he agreed to produce the band’s next record. (Wagener discography can be viewed here: www.michaelwagener.com) The buzz was now in effect, having landed the band in MIX Magazine (print), Metal Maniacs Online (net), This Is Rock (Spain, print), Blabbermouth.net (net), Prosound News (print), Blistering.com (net), Bravewords.com (net), New Herald Dispatch (print, net), Flash Magazine Italy (Print, net), Fireworks Magazine UK (print), Classic Rock Magazine UK (print, net), Rock Hard Magazine France (print) among many others. The band now had a presence world wide. After leaving the studio in September, the band headlined the second stage at the popular Xfest in West Virginia, put on by Clear Channel station WAMX. Other bands on the bill include the Gold selling Seether. Regional Clear Channel General Manager Judy Jennings has backed the band by putting them in rotation on WAMX (106.3) and WKEE (100.5). The fall also saw the band finalize another piece of the puzzle, with legendary photographer JOHN SCARPATI (Rolling Stones, Dixie Chicks), handling their photo shoot and album cover. Then the last piece of the puzzle; a label. The band chose to develope their own on the idea that who better to look after them? In October 2006 Bombshell dropped officially in the US hitting the Billboard on three different charts to mark it amazing release. EXPLOSION With billboard charting, 3 tours of Europe and 2 releases under their belt the band changed bass players for Chris Sammons and Drummer to Josh Kitchen and released a live offering up for the fans that were not able to see them on the Bombshell tour. Strip’em Blind Live was released in July 2007 again by their own label in the US and again on the bands label in Europe as well. This live offering was recorded on September first of 2006 in Charleston WV in front of 15000 screaming people. It showcased the band in a big way and even though it was a bit early in a career to be releasing a live CD it worked great. 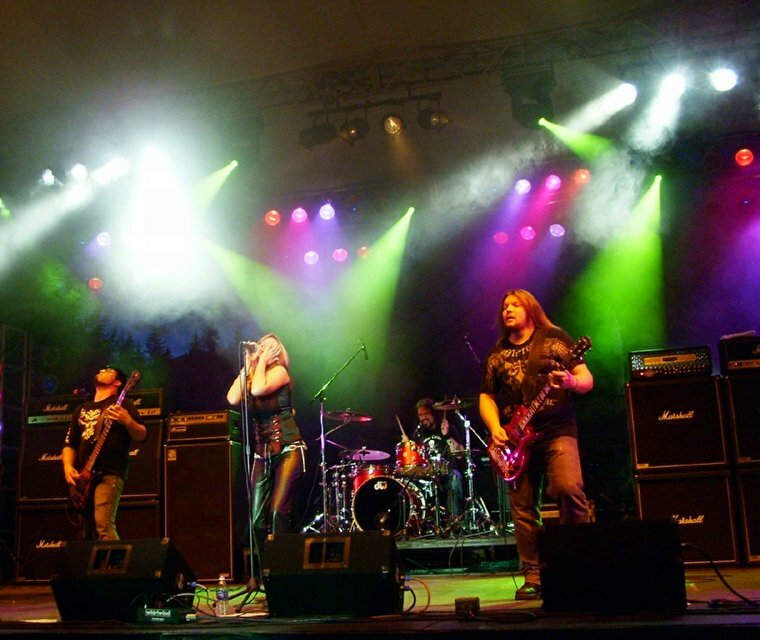 In January of 2008 the band re entered the studio to record Bombshell’s follow up in Deadly Passions. This time was a bit different as Jeff Boggs has stepped down for family commitments and the band had signed what was thought to be a great deal with Demolition Records to cover the world and get a big push. While the CD itself is a stellar piece of modern molten Hard Rock the label faltered in every way to deliver. The band toured relentlessly both for the release in the US and as a one guitar player band but never got to Europe or any other part of the world. There wer a lot of festivals that year and the DP tour that the band saw themselves playing multiple shows with bands like Seether, Shinedown, Rhino Bucket, Great White, Chevelle, Crossfade, Bobaflex and a small tour with Derringer. Deadly did hit the CMJ radio charts at number six in the states and did very well for the remainder of that year. Hydrogyn continued to tour throughout 2009 and releasing a DVD called No Borders which again struck the charts in the US because of their great following. In the fall of 09 the band had taken its first rest in almost 6 years. 2010 saw the experiment with Jeff Young (ex Megadeth) entering the band. After 5 months of trying to get the cog to work with Young the trial period ended. 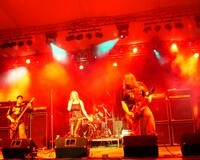 With Young out of the band in July of 2010 the band finished up Judgement. Judgement released in October of 2010 to hitting the top Heat Seeker charts at #10. Shortly after the release Julie fell ill and was unable to tour to support the cd. This was to go on until June of 2011 when she was finally cleared medically to resume her rocking ways. Even with the success of Judgement the Julie was not happy with the direction of the release and wanted a hookier more groove laden product. After approaching Jeff Westlake about the next release and what she wanted from it the two settled down into writing. While writing the CD long time friend Mike Jublin from France had contacted Jeff after hearing the news that there would be a new Hydrogyn record to discuss a unique possibility. After a phone call with Jublin the band had decided to try a collaboration with French Producer Patrick Liotard and Anthony Dura from France. The collaboration was to be a cover tune of Heavens on Fire from Kiss and it worked great!! In July of 2011 all lights were green to proceed with what is now Private Sessions. After two months of writing and recording both at Westlake’s Ridgeline Studio and Peek Studio, Boisseron, France the band was finished with the new release. Following the success of Judgement the band stayed with the system in the US that had achieved the numbers it did. In Europe the band has changed gears and gone with Music Buy Mail for this release and a more self controlled way of doing business. 2012 is looking to be a great year for the band and it is starting out with a great new release in Private Sessions. In 2004, West Virginian guitarists Jeff Westlake and Jeff Boggs had a vision. They set out to create music that defied convention – power metal that appealed to a broad audience. 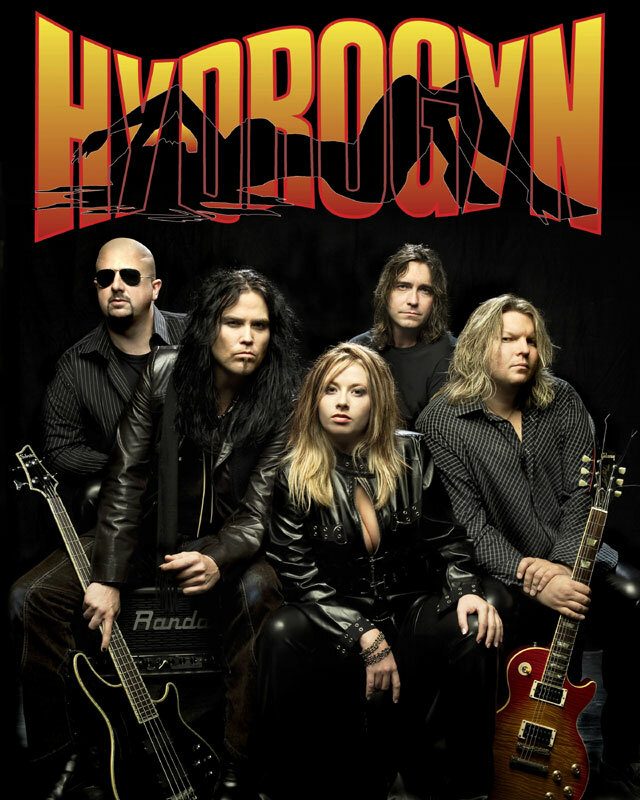 Combining cutting edge riffs, intelligent lyrics, and massive hooks with the multi-octave power vocals of Julie (“just Julie”), Hydrogyn exploded onto the national music scene. Their debut album, “Best Served with Volume,” quickly caught the attention of major sponsors, including Pepsi, Budweiser, and Off the Rim Apparel from NASCAR. And that was just the beginning. In 2006, Michael Wagener, who had produced Ozzy Osborn, Skid Row, and Alice Cooper, came on board to produce “Bombshell” which hit Billboard on three different charts. 2008 saw “Deadly Passions” on the CMJ Charts. “Particles” box set, “Break the Chains” EP, and a number of DVDs. But working this hard and burning this hot began to take its toll. In 2015, halfway through recording a new album, Julie left the band. In 2016 Hydrogyn went back into the studio for their most ambitious album yet, “Redemption.” Like the element after which they take their name, Hydrogyn went back to basics, taking the process down to its most elemental level – high energy, high creativity, positive vibes, and raw power. “I knew this was where I belonged,” Parrott said after meeting with Westlake. Her aggressive vocal talent and positive energy were the spark that reignited the flame for the entire band. Collaboration has never been stronger and the energy has never been higher. The result is Redemption, an electric, hard as nails, tour de force album that is hitting the broadest audience for the band in over a decade. Guitarist Jeff Boggs said it best. “There are no limitations.” Hydrogyn is on fire.